Nankhatai-means 'Bread made with six ingredients' where 'Nan' stands for 'Bread' and 'Khat' meaning 'Six' refers to the six ingredients.These are eggless Indian cookies which had its origin in Surat,a large port city in Gujarat. The birth of Nankhatai has a very interesting history. In the 16th century, the Dutch explorers came to India for setting up posts for trading spices in India.Surat was a highly occupied city then .So they started a bakery in Surat for making breads for their consumption .The bakery had five parsee employees.When the Dutch left India,they handed over the bakery to one of its trusted employees named 'Mr.Faramji Pestonji Dotivala'.And soon the bakery became 'Dotivala Bakery' . 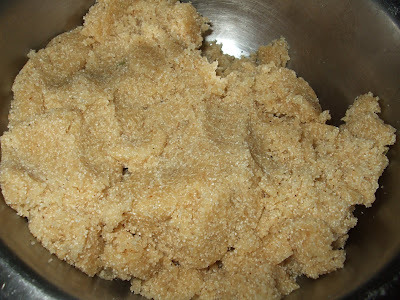 The Dutch style breads/cookies were disliked by the Indians and the business started to decline.So Dotivala decided to become the master of fusion cooking for financial survival..He used 'Sura' (a sap from Palm tree ,or toddy) instead of yeast for fermenting the cookies and named it 'Farmasu' or 'Suri Batasa'.Modified the 'Puff pastry' to the salty 'Khari' (biscuit),which is spiked with ajwain on the top layer.His one such modification is the 'Nankhatai' which is the combination of 'Dutch butter biscuit' and a Gujarati local sweet called 'Dal'. The other popular biscuits of the Dotivalas include 'Irani Biscuits' which are nothing but the second time baked leftover 'Sura biscuits'. 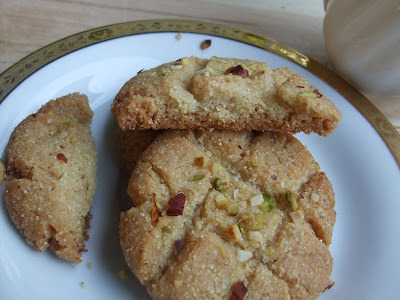 There is a very large population of Gujaratis in Bombay.So they transported Nankhatais to Bombay where it became a very popular tea time snack.People enjoy them dunking in hot masala chai. Amused by its history,I couldn't wait giving it a try.I derived the recipe from Manjulaskitchen and it came out very well.It was liked by everyone at our home. 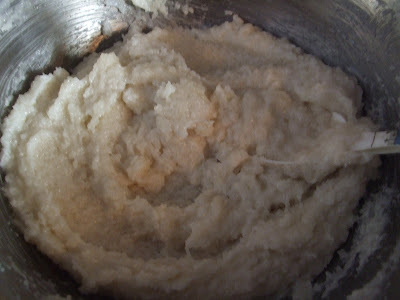 Combine Butter and sugar to a smooth paste. 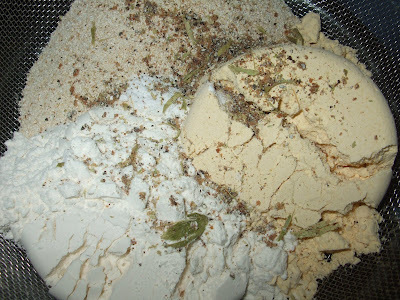 Sift together Besan,Maida,Semolina ,Cardamom powder baking soda into the bowl of butter/Sugar mixture. Combine and knead well to form a dough. 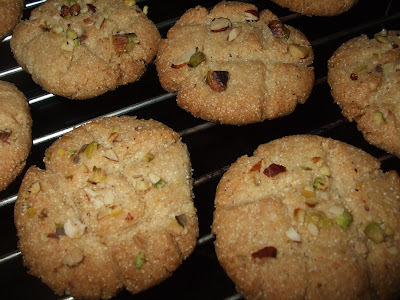 Shape them into small cookies and make incisions on them with knife.Press the sliced nuts on top of the cookies. Bake them for about 20 mins in a 250C preheated oven. Transfer in a wire rack and allow it to cool. 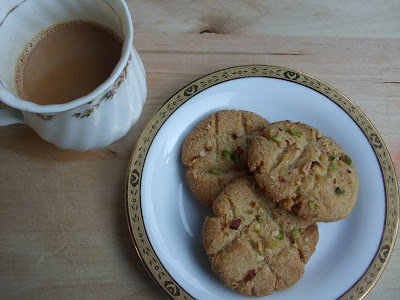 Verdict: The flavour of Cardamom emanating from the oven while baking was so inviting.The Semolina of course added the crunchiness to the Nankhatai.But I guess it could be even better if grounded semolina is used.It was indeed a pleasant experience to have these Nankhatais with a hot cup of tea on that dirzzling evening. 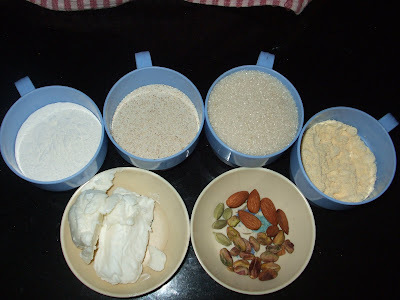 Excellen recipe. 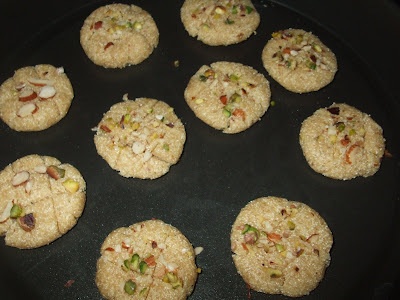 I have tried this recipe and the result was very good and my children love to eat them. Thank you for the recipe. God bless you. Cauliflower Pulao & Malai Kofta!